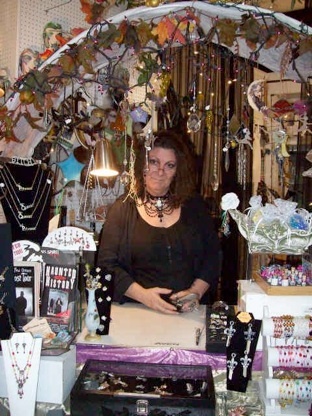 dawna luciano-bennett has been an artist since early childhood. Having tried many forms of artistic expression throughout the years, when she found glass and solder, the true journey began. It’s been a 17 year adventure, learning the intricacies of designing with solder. While most stained glass artists strive to form their solder seams as smooth as possible, dawna lowers the temperature and builds designs into her solder, sculpting scenes on goblets, mirrors, kaleidoscopes and many other items. The result is a unique blend of three dimensional, mystical magic, inspired by the fantasy realm. Each piece is individually designed and created with a commitment to originality and artistic expression. Please enjoy your glass and solder creation, and Thank You for supporting our artistic endeavors at Glass Magick Designs! IMPORTANT: dawna is very busy at the moment. Although some of her work is available in the shop, she will be moving to a ‘made to order’ system. Stay tuned, soon there will be a portfolio of possibilities to choose from. And remember, get your holiday orders in early! Decorative Soldering is a technique known by many, practiced by some and mastered by few. dawna has definitely become a Master of the art form. Her solder work is as distinctive as Picasso’s or Van Gogh’s brushstrokes. If you are a collector of stained glass art pieces you really need to have a luciano-bennett. You know her work as soon as you see it again.